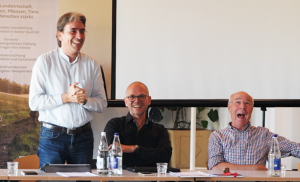 Demeter-International General Assembly elected a new board and worked out strategies for future development of standards, certification, training, marketing and policy activities. 21 years after its foundation, a major change is taking place: The pioneers Thomas Lüthi and Susanna Küffer stepped back from their functions. Thomas Lüthi was given the title of honorary president for his long term commitment. Throughout all these years as president he has been able to bring together the diverse certifying organisations which make up the global membership. Susanna Küffer received the title of Honorary Board member as she developed during her term in the Board of Demeter-International the administrative, trademark and lobby work sector across the entire organization. The Biodynamic Association India became a full member of Demeter-International , bringing the total now to 19 member and four guest member organisations. Altogether, more than 187.000 ha land are Demeter-certified 5387 farmers and an additional 979 processors are certified as complying with Demeter/Biodynamic standards worldwide.